Ernest Dichter is famous as one of the founding fathers of motivational research. In applying the social sciences to a variety of problems, Dichter emphasized new approaches to problem solving, advertising, politics, and selling, and issues of social significance such as urban renewal, productivity, and drug addiction. As an author and corporate adviser, he used psychoanalytic theory and depth interviewing to uncover unconsciously held attitudes and beliefs. He goal was to help explain why people act the way they do and how positive behavioral change might be achieved. 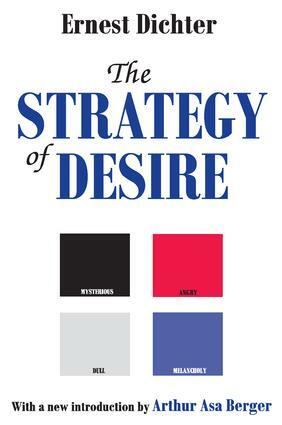 In The Strategy of Desire, Dichter both counters the argument that motivational research amounts to manipulation, and shows how the understanding and modification of human behavior is necessary for progress.